In 'Downtown Detroit' two kids are looking to break into a suspiciously nice car that wound up parked one a narrow street. There's probably a body in the trunk or something, but before we get to that, what's with the 'Downtown' part of the title? Is that the kind of tag they've ever put on a location before? There's a huge amount of towns that make up the greater Los Angeles Area, but I've never seen specificity when the head to LA. So what's with this 'Downtown' nonsense? Did the tourism department of Detroit threaten to stop advertising on CBS stations if they didn't remove a reference to Detroit being a lawless hellhole where street crime is ever present? 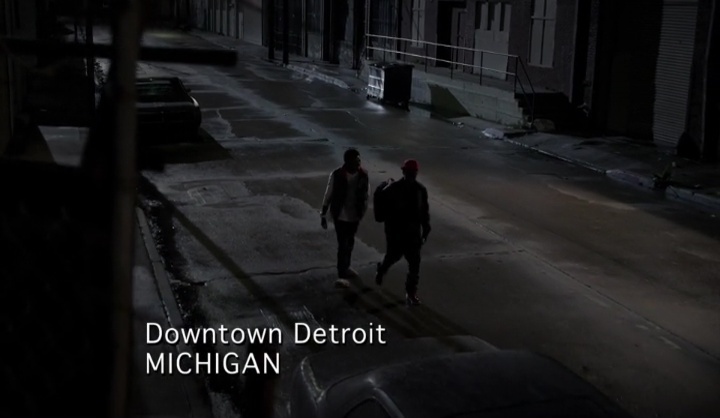 But the episode couldn't be re-shot, so they negotiated a additional word to suggest that only a small section of Detroit is a crime-ridden hell hole? Anyway, the car is unlocked when the kids go to break in, but are stymied when the car turns out to be keyless. They say that the 'clicker thing' must be somewhere in the car, but I don't think that's the case. After all, if the clicker was in the car, wouldn't the start button work? Isn't that the whole point of keyless systems, that you just sit down with the thing in your pocket and you can star the car right away? Turns out I was right, the kids finally just try pushing the start button, and the engine turns over! They start to drive the car away from the curb, but hear a thump from the trunk. Could the corpse have finally arrived? Yes, and it turns out there's two of them? The kids prove to be quite stupid, deciding the convenience of finding the key on one of the bodies is worth the risk of being implicated in a murder, so they decide to dump the bodies and steal the car. The woman with the keys turns out to be alive, however, and begs them for help! The kids are too scared to do anything but run away. Which, you know, bad luck for her. Over at Jeanne's house, she gets a phone call from her husband, who is a MSF doctor! He pretends to be in a foreign country so that he can surprise her by showing up at the door! Do you think she's told him that they're being targeted by a serial killer? Jeanne's happy to see her husband, but worried that he's suddenly back from abroad! Penelope texts with a job, but she wants to prioritize the relationship. In the end, she goes to work, in order to fail even harder than the other characters at justifying her paycheck. Time for the case rundown! Married couples are being abducted, tortured with dozens of small knife wounds, then killed and dumped in their cars! That's depressing, but in the 'good news' column, it turns out the kids immediately ran for help and called the police! But the ambulance was there too late to save the woman. They're psyched to find and stop the guy before he kidnaps another couple! Of course, they're too late for that, as we immediately cut to the next victims. Who he grabbed overnight? So he dumped the car yesterday, and he's already got two more locked up somewhere! The first thing we see is the woman with blood all over her white shirt - does the killer give them those clothes, so the blood will 'pop' more, or does he only grab people wearing white shirts? Then the husband leans into the frame in a light blue shirt with no blood on it, and my theory is blown all to hell. I will make an obvious prediction, however - the killer makes the couple stab each other! The wife has a knife buried in her stomach, and she tells the husband to take it out, killing her, because 'it's time'. He does, she dies, and I guess we'll find out what all this is about after the credits! Some details from the plane ride! The victims were all white, and from Grosse Point, so they're assuming the killer lives there as well so that he can blend in. They try to guess exactly why the killer might murder couples, is it to mock their marital bond? That seems like a stretch, although if you'd phrased it a little differently, I'd probably be supportive of the idea that he gains more perverse pleasure from tormenting people with strong emotions towards each other. Jeanne and Joe drop by the morgue, and find out something interesting - the spouses have matching injuries placement-wise, but not in type of slash! Each is cut in a different direction! They use this info to confirm my prediction that the couples stab each other! There's a check-in with Reid's map of the couples' final movements. Both were on 'Date Nights' in Grosse Pointe when they disappeared, so the working theory is that he grabbed them at their cars. So that means lots of surveillance cameras, right? Both couples were in well-traveled areas, so shouldn't there be all sorts of records of their (and possibly the killer's) movements? At least one of the couples must have been in a parking garage, doesn't that almost guarantee footage of the killer? Over at the impound yard, JJ and Derek examine the cars to try and figure out how the killer could possibly control two people into doing what he wants! They seem to be under the impression that pointing a gun at them wouldn't work. Hilariously, they assume that the husband and wife are going to sit in the front of the car, with the killer in the back. Um... why would the killer let the wife walk around the car away from him? I don't want to go down a dark rabbit hole of gaming-out crime situations, but couldn't the killer just grab the wife, point a gun at her, tell the husband to get into the car, climb into the back with the wife, keeping the gun on her, and then instruct the husband where to go? Their complete lack of imagination causes them to find a lead! When you press the 'lock car' button on the car's fob, it makes a sound, but the door doesn't lock - the car has been hacked! Get it? The kids at the start were old-school car thieves, and the killer is a high-tech version of them! Oh, and there's been another car dumped with a body in it! That's right, it's just one, which is why we didn't see any blood on blue shirt guy! Jeanne and Reid interview the sobbing husband, who's been brought to the scene for reasons I'm not clear on. Actor scheduling, maybe? He's not the blue shirt guy, though, which is significant! Could the killer have mistook a woman and her paramour for a married couple, then only killed one of them the normal way when he discovered his mistake? The husband's interview is incredibly confusing. Apparently he didn't report her missing because he was working in Cleveland, and was supposed to be back for Date Night on Thursday, but his boss told him he had to work the weekend, and she was annoyed and went to the dinner alone, which is when she was grabbed by the killer. How does he not try to get his wife on the phone for two days after a fight? This was not a good marriage, even before one of them was dead. This scene is also super-confusing when it comes to just how long the woman has been missing. We know she was grabbed on the Thursday, which is when the last car was dropped off. And we saw her die Friday morning, between the team discussing the case and getting on the plane. Now they're saying the husband didn't notice she was missing for two days, which makes this... Saturday? Has the team already been in town 24 hours? Damn this show and its complete inability to convey how much time is passing from scene to scene. The team wonders where the missing male victim could be! 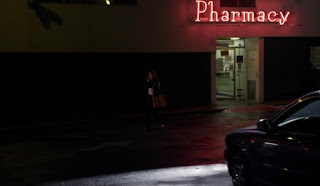 Meanwhile, the killer abducts a woman from a pharmacy parking lot! I feel like we've seen that exact Pharmacy sign before. Maybe more than once. I swear this location has operated as a pharmacy in multiple cities, both in day and nighttime shots. Back in Virginia, Jeanne calls her husband to check in - he maintains that he's fine, and he was only being cagey because he has a job offer. Two, actually, for both of them to teach at Harvard! Jeanne's still psyched about being an FBI Agent for some reason, which is going to cause some tension. Perhaps this case about butchered husbands and wives will give her a chance to reflect on her own situation? Greg and Jeanne are the next pair to visit the morgue, where they find the woman has the same nervous cuts that they've seen with other victims. Could it be that the killer has kept the man alive, and may have him kill more than one woman? It's time for the profile! The team says that the killer is killing couples because his marriage went bad. Fair enough assumption. They also think that finding the man who's currently kidnapped as well will be the quickest path to the killer! Unless, of course, he is the killer, and he's evolved his fetish to just wanting to kill women, rather than focusing on couples. And, you know, he's pretending that he's also a victim with the kidnap victims, and they have to follow the orders of a Jigsaw-style audio tape or something? I'm getting ahead of myself with these predictions. Let's just get back to the latest kidnap victim, who's waking cell, wearing a just ridiculous wedding ring. The cell is entirely made of glass walls, and seems to be situated in the middle of some kind of old office building or possibly hospital. There's a connecting door to the other victim's room, but it's currently locked. So the woman bangs on the glass, trying to wake the guy up. Eventually she starts yelling at the cameras, the victim addresses her, warning her not to make noise, because that would attract the attention of 'him'. Just then some banging starts somewhere above them. So the victim could have a partner! Or really be a victim. Or just rigged up a remote-control noise-making thing. The killer hacked the car, after all. Speaking of car hacking, JJ, Derek and Greg are back at the impound lot, looking for more clues about the cars' computers. Which they didn't need to do, since they know nothing of how computers work, and Garcia's already got it handled. Seriously, she calls them from Quantico to tell them all the important information about the car they're standing next to. They're reusing a weirdly large number of locations this week. Were they trying to cover a budget shortfall or something? Garcia's information is key: all of the cars were hacked three days before the abduction, and had their ability to record or upload GPS data disabled, so there's no record of where the killer drove them. Interestingly, the cars weren't all serviced or washed on the day of the hacking, which leaves the team wondering how the killer could have had unfettered access to all three vehicles on random days. Greg's got an idea though, and he calls the Attorney General to ask for a favour! What could it be? Using some kind of patriot act sci-fi stuff that tracks every sat-linked car on Earth all the time? Then it's over to the woman and the victim. He lets her know that he's been in the cell since April! Which seems at odds with what happened with the couples, I guess we'll find out more when he's revealed to be the killer. Wow, I'm really going all-in on this theory, aren't I? While he explains his situation, a videoscreen snaps on in both rooms, where a tape of the killer tells them to begin. Victim apologizes to the woman and takes out a paring knife! Greg and Reid go to meet with the heads of the 'big three' car companies, and we immediately discover why they set this episode in Detroit. Greg wants access to that thing I just mentioned about - the secret driving history of every car that the car companies all keep! The victim goes into the woman's room and gives her the knife! It's his turn to be stabbed! Garcia figures out what all of the cars' trips had in common - they all stopped at a jogging track! Joe and Jeanne take a look around, and see plenty of couples jogging together, as well as women with personal trainers who they could possibly be sleeping with! Instantly they assume that his wife left him for another man she went running with, and he uses the track as a hunting ground because it reminds him of why he's so angry. Here's my question - isn't it an amazing coincidence that all of the couples/women he attacked stopped by the same running track three days before the date nights on which they were kidnapped? Isn't that kind of preposterous? Why did it always have to be three days? Couldn't all of the computers have just been erased up to a week before the abductions, and Garcia just had the computer sync the GPS information with the day each car was hacked? More with the stabbing people! Victim reveals he's already got a bunch of stab marks, so it's fine that she cuts him, but she's still reluctant. Finally the killer starts a countdown, and victim makes woman stab him a couple of times. Yeah, it looks like I'm wrong, but we're still not seeing any direct interaction between the masked figure on the screen and the people in the cages. Okay, we now get a weird scene at the police station. The team has put up pictures of all the missing men in Grosse Pointe - they like the looks of victim, because his mother reported him missing right after the single lady disappeared on Thursday. They then go into how he met his wife while she was married to someone else, and suggest that could have convinced the killer to target him. Except, you know, he said that he's been locked in the cell for a month, and has wounds all over him. I guess he is the killer? In the cells, victim confesses to woman about dating his wife while she was married, and woman says she met her husband on a Christian dating site, but that she's Jewish! Zany! Then they're separated back to their own cells. Victim fakes a hug so that he can whisper that he has a plan for them to escape! Is the plan for him to claim that he can fake-stab her so that the killer will think she's dead, which is why the woman in the first death scene seemed to be psyched about being stabbed? I'm really going to extremes to justify my theory at this point. Hey, quick question - remember how the car companies were keeping secret information on all the cars, even though the cars' own computers didn't have GPS capabilities any more? Shouldn't they also know where all of the cars have gone in the past few days, i.e. where the killer offloaded the victims and then loaded up their bodies? Seems like that would be an interesting location to know about, wouldn't it? I mean, I guess it's possible that the hacker turned off the car's ability to upload location data at all, but that doesn't seem likely, since Garcia had to work to figure out what location all of the cars had in common, rather than just check the last location they were at when they lost the ability to transmit info. While driving, Jeanne gets a call from her husband, and she doesn't want to talk to him! She reveals all of her secrets to Reid! She maybe doesn't want to be separated from her husband any more, but she doesn't want to give up her career either! What a dilemma. With, you know, a pretty simple solution. Remember how there are FBI offices in Boston? You don't have to teach exclusively, you know. Reid, because of the Maeve situation, thinks she should be with her husband! Is she leaving the show, or are they making it look like she's leaving the show for one reason, just so we'll be surprised when they kill her off because, as we've already mentioned, the copycat seems to be focused on her. Back in the cells, it turns out there really was an escape plan! The woman is able to pull up a tile in the floor and crawl through a cable access line! Is this all part of the killer's game? After sending her down the hole, did he immediately get into costume and run to where the hole lets out just for the fun of catch-and-release murdering? Reid and Jeanne visit the mother of the victim, who confirms that he's the killer. He used to go to the track to stalk his wife, who he's sure was going to cheat on him. Eventually his dickishness drove her away! The mother even calls her son 'sick', just so we'll get the point that he's the killer. Jeanne realizes that the man the mother is describing fits the profile, and asks if his 'sickness' takes the form of ritual self-cutting, which he does! That's all they need to know, of course, and they'll be on to him post-haste! As predicted, it was just an elaborate catch and release scenario, and the killer waits for the woman to trip on a wire and daze herself before he walks out in his hastily-donned costume. Then he tears the mask off, just in case the audience hasn't figured it out yet. They must not thing much of their audience, really - after all, at this point there's no reason for him to take the mask off. After all, he's got to move her back to the room, and doesn't know how long she'll be out cold. Doesn't this risk him blowing his whole 'stabbed by a friendly guy' scheme? In the cells, woman wakes to find that the killer has cut himself up a little to make her feel sorry for him, and then uses a remote control to get her to cut him further. This is certainly a strange fetish. Garcia reveals that the killer is a contractor, and goes over a list of buildings he has access to. Only one of them is believably large and isolated enough for him to be playing elaborate games of sympathy and murder in! Also Jeanne has a theory for how to talk him down, which only she can arrange, and says that it's a pretty big bluff. Is she going to pretend his wife is there to talk to him? Are they going to bust in pretending that they think he's a victim? I can't wait to see what happens at the cells! Speaking of, the killer asks the woman to stab him, claiming he's been in there so long that he doesn't want to live any more. They're really getting close after only knowing each other for like six hours. Yeah, this just went crazy. They show us his plan to turn this suicide into a murder, and it's a doozy. He figures that, by asking for death, he'll cause the women to say 'what happens to me when I'm alone with the killer?' And he responds that they should double-suicide, which just turns into him murdering her. Wow, would this never work. You're saying that previous woman was psyched to commit suicide with a dude after spending half a day with him? Wow, do this show's timelines make no sense whatsoever. I mean, if they were there for a week, with her being slowly worn down and starved, maybe, but it's half a day, seriously. While they're chatting the FBI breaks in, and the killer immediately grabs the woman, since he knows the jig is up. He demands that the cops drop their guns, threatening to slash the woman's throat if they don't. They're standing approximately five feet away from the killer, and he's holding the knife blade a good three inches away from the woman's cheek. This feels like a good time to just blow his head off and take your chances. But no, it's time for Jeanne's plan - she's the only one in there, other than a SWAT guy. Okay, the plan is to just have the wife come in and ask him to let the woman go. Why were they so cagey about the plan, why was Jeanne the only one who could do it, and why did they say it was a 'bluff'? This is just like hostage negotiation day 1 stuff. Maybe they thought it was a 'bluff' because they had to ask the wife to lie and say that she could get back together with the killer if he let the woman go? But that's not really a bluff. It's just a lie designed to manipulate a guy, which, again, Day 1 hostage negotiation stuff. Really they should have just shot him in the head. Also, Jeanne sees woman reunited with her husband, and it convinces her to make a decision. That decision? She needs to keep trying to catch serial killers while he works in Boston, so they can see each other more often! Why did seeing the reunited spouses make her decide that? Seeing people hug in relief convinced her that she needs her space? I'm kidding, I know that she saw them reunited and wants to keep helping people, but if they wanted that to be her reaction, she should have contributed a lot more to figuring out this case. They tried to make it look that way at the ending putting her front and center, but then her big idea was 'hostage negotiate', which literally all of them have done many times before. A little! I'll give them that Jeanne was smart enough to guess that the guy loved to cut himself, but it wasn't much of an educated guess. Seriously, they were looking for a guy who hated happy couples, and then a woman called them up and said 'my son is missing, he's a creepy stalker with serious mental problems'. Mom did most of the solving this week. They had a magic GPS record that would have led them to the place that everyone was being held. So yes, the cops probably could have found them. Beyond that, it doesn't take psychology to figure out that, when a psychotic stalker is one of your missing people, there's a better-than-average chance that he's the killer. The show's compressed timelines really hurt the drama this week. Especially because we're asked to believe that the killer, after grabbing a woman instead of a couple, was able to throw together a whole interactive video presentation operable by remote control, as well as gain the acting skills necessary to convince a woman to kill herself like ten hours after meeting him? And he did all of that in under a day, because he grabbed that woman Thursday night and killed her Friday morning? I want to say it's possible that he had the first one for like 36 hours, because maybe the team was called in on a Saturday? The show is maddeningly unclear on timelines. But that's probably not the case, since he only had the last victim for a few hours before starting the double suicide pitch, and there's no reason to believed he would have changed up his MO between victim one and victim two. The thing that confuses me the most about the episode, though, is that it's set up like we're supposed to be surprised that the victim is the killer - he even does a mask unveiling! - but then the first line he says, about being a captive for weeks, is utterly blown apart by the first thing the team finds out about him, that he's only been missing for three days. It's like the episode couldn't decided to be about us watching the killed and being way ahead of the team, or be a mystery where we shocked by a twist, so they ended up doing both? Weird. You know, maybe they got such poor reviews for the nonsense writing in that Ken Olin episode that they decided to really blatantly set up the twist that time so that absolutely no one could be confused by it. hey I have read all your reviews for criminal minds and am currently on season 8 episode 22 and reading the one you just posted for it. I was wondering if you are planning to continue reviewing the rest of the episodes and seasons? Yup! Every week for the forseeable future! Now you will readily locate a place to watch movies online free. Morning time calls for a first-class watch movies free online cartoon website, and a great huge breakfast.